Tuesday morning’s rush hour caused prices to peak at $40, but the traffic was more quickly than it had done in the past. News4's David Culver reports. Dynamic toll prices that go up and down depending on how many people are using the I-66 express lanes were supposed to keep traffic down. However, a Virginia legislator wants to regulate the tolls, which could slow down the flow of commuters. Tuesday morning’s rush hour caused prices to peak at $40, but the traffic was more quickly than it had done in the past. The flexible pricing is only in effect during rush hour, and carpoolers with two or more people inside can travel toll-free. 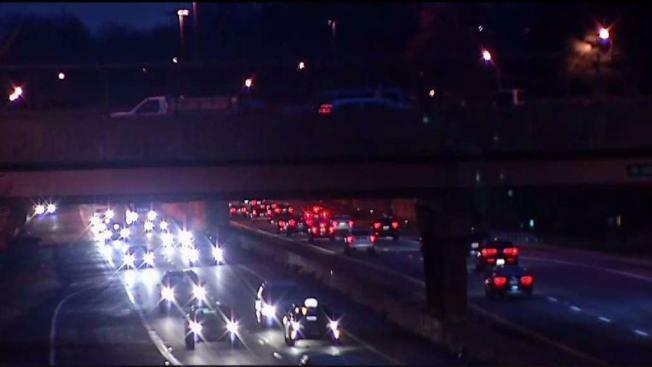 The Virginia Department of Transportation said vehicles were moving around 55 mph over the past two days with dynamic tolling, compared to about 34 mph at this time last year. The toll prices are designed to rise when many people want to use the road and lower when road use is lessened. “We’re already seeing improved travel times,” said Michelle Holland, a spokeswoman for VDOT. Those high prices caused concerns for single drivers, and a Loudoun County, Virginia, lawmaker wants to put a cap on pricing as well as shrink the amount of time the tolls can be collected. “This is just way over the top,” said Supervisor Ron Meyer, R-Loudoun County. “It's only affordable for people who are mega millionaires, and it's just not appropriate." Meyer is on the Northern Virginia Transportation Commission, the agency that receives the revenue generated by the I-66 tolls. He said the increased money would definitely help with other projects, but the costs are too high. "We like the extra transit revenue," Meyer said. “We want to build more projects, and people are getting a service being able to drive single occupancy vehicles on (Interstate) 66. But it needs to be affordable." Holland said capping the toll prices are going to result in clogged roads. "If you cap it, it's not going to works as well," she said. "The whole reason we're doing this is to provide a more manageable and a more consistent commute. If they choose to pay that price or if they carpool, they're going to get through 66 in a more reliable timeframe."